For this week marks, not only a free concert by The Tragically Hip to kick of the 2014 NHL season; but more importantly, it marks the 22nd birthday of the release of the Hip's fourth album -- Fully Completely. If you're an individual of my "vintage" than it would be safe to say that somewhere in your home you own a copy of The Tragically Hip's album "Fully Completely." It may be in a box deep in the bowels of your basement or neatly tucked away into the large, black, padded CD holders we used as our playlists; these cases were our "My Tunes Library." I am confident that if found, your copy of "Fully Completely" it would show the wear and tear of a disc that has been played in numerous car stereos over the years. It may have even traveled with you to the sacred lyrical Hip locales of Thompson or perhaps even Bobcaygeon? It's most likely more scratched up than your mosquito bit-legs during a May 24 cottage weekend, but regardless; you still possess this fine album and there is no greater week than this one to break it out, pop it in and press play. This is the album that followed their early dirty, bluesy, Canadian rock sound and took them into a newer sonic landscape, accented with a much more poetic Gord Downie guiding you along. This album marks the birth of the lyrical storytelling that, for many, would become the core of what makes a Hip album. Their inspirations and influences are woven together in the lyrics starting with the quick shot chord and bass line dance of the opening bars of Courage (for Hugh MacLennan) -- one of Canada's most gifted authors. The songs on Fully Completely deal with a variety of topics and events ranging from uncomfortable family dilemmas, where things are sometimes better left unsaid to travelling across this great land looking for a place to happen (while the occupants of the car attempt to ignore the "let me out" shouts coming from the trunk of the car). The albums references, locations and characters all blend into a trippy Canadiana dream/nightmare -- like The Odessy directed by Atom Egoyan. The albums dark, hypnotic vibe is also perfectly captured by the use of colours, numbers and contorted, compressed bodies found on the cover art created by the Dutch Artist-Lieve Prins. The Tragically Hip are one of those polarizing bands that can turn some people off of their music for the exact same reasons others are so turned on by their music. 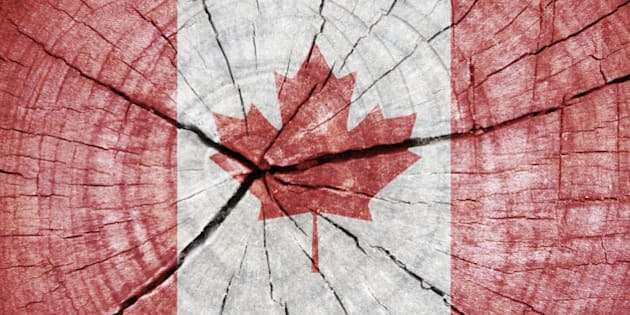 Their passion for placing Canada and it's personality in the forefront of their songs can deter those who feel they are pulling at patriotic heart strings. Some find Gord's rants and David Bryne-like live performances a bit of a distraction. I have admittedly fell in this camp at times, but have never lost sight of the energy this band produces in studio and on stage; nor have I viewed it as a "bad" thing that they, at times perhaps unwillingly, are labelled not just a Canadian band, but "Canada's band." I support this statement with a personal experience. For it was on my trip abroad for a friends wedding in Lyon, France that I realized the significance of this band and the national weight they carry with them. I, along with my "maple-leaf-patch-wearing" Canadian friends and several French speaking members of the wedding party were gathered at a long table after a gluttonous meal of local French flavours. Upon learning there were a few guitar players among our party (me being one of them) the men asked the Chef to bike home (no joke) and grab his guitar. After a short time, the panting owner returned with a six-string and in no time the French side of the table were singing traditional songs and filling the restaurant with their wine stained vocals. Then the guitar was passed to me. "Play us a song" the sweatiest and most inebriated of the singers said to the Canadian side "that to you, is Canada." Surrounded by several drunk wedding party members, my fellow Canadians and I paused to search our internal data-bases for that perfect tune that would not only act as our musical passport in this foreign land, but could also enlighten our new found friends on Canada. And with those thoughts dancing in our heads, I strummed the opening chords of Track 10 off Fully Completely. From the moment we, as a Canuck collective sang about a "Sundown in the Paris of the Prairies," we knew that we selected the perfect song. With a sharp accent on the line regarding a "late breaking story on the C-B-C" we soaked in our collective national pride, embraced the memories we associated with this tune that had been played so many times around a campfire and reveled in the beauty of a great song finding new ears. Fully Completely is an album that could be part of a killer Box set of my High School sound track- with it's melodic guitar work, thick back beat, familiar warmth of lead and backing vocals all mixed with the snapshots of shady, yet complex characters occupying various frost bit locations. It's an album upon listening to 22 years later still takes me back, with each track acting as a musical/mental bread crumb I left behind...one at a crowded house party, one beside the cooler by a campfire or one cruising in my car with the 401 in my windshield and my rear view mirror. Anytime I can find an album that connects me to my friends, my city, my country and my life experiences the way The Tragically Hips Fully Completely does I cherish it. I embrace it. I take pride in the fact that these boys from Kingston have played such an important role in so many peoples lives. I'm amazed that in 2014 they will be on stage, doing what they do best for the huddled masses in front of the ACC and I'm amazed that I can still press play on Fully Completely and let the memories flood in. I also know that albums like this are rare and you should feel lucky to have them enter your life. I know I'm lucky it entered mine. Having an album as special as Fully Completely in my collection and in my memories lets me know that I can die happy. Just get Ry Cooder to sing my Eulogy.